Kalapani Komkali is the daughter and disciple of Kumar Gandharva and Vaasundhara Komkali. An awesome inheritance resides in their genes. The curious consequence of this circumstance is that it is not only an affirmation of what is called the Gwalior Gayaki but also of the wholly reconstructed and transformed style that revolutionized Hindustani classical music. The Gayaki of Kumar Gandharva is a difficult inheritance to claim. Merely developing a Gayaki of the weave and quality of the inheritance is a daunting task which Kalapini has been able to fashion with grace and beauty and there is little that Kalapini is on her towards exceptional musical distinction in her life’s work. Her voice and musical presence already posses exceptional implication and that would remain a matter of abiding curiosity and interest as she grows older. And most of all she is capable of shattering effort of dedication which are even more important than any gift mere mainstream intelligence or any other natural inheritance she might have possessed. Kalapini can be said to posses an alto just a little hustky but true as a blade. Her aakar is perhaps closest yet to that of Kumar Gandharva a magical mixture of the five vowels that make the language ring true and unforgettable. She uses much the same technique her father used to do that lets you hear the swara as part of the raga and swara also as pure swara kindled separately and individually not two people can ever do this the same way but when it is achieved the listener notices its strange impact. The next thins is to listen to the sahitya of the Bandishes with its gentle folk intonations the whisper of the land of Matwa which Kumarfi first brought to life. 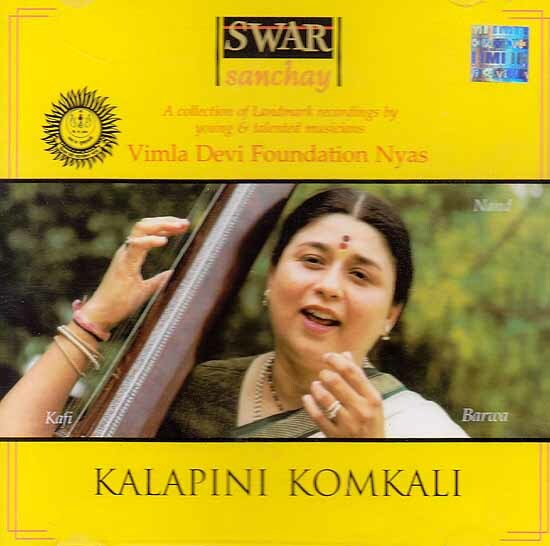 Kalapani has performed widely across the country in many prestigious music festivals after her post graduation in Library Kalapani learnt music forms her father and is now an active trustee of the Kumar Gandharva Sangeet academy which has been structured to present and promote his genius. At present she trains intensively with her mother. Vimla Devi Foundation Nyas Ayodhya has been established in the pious memory of the late Rajkumar Vimla Devi of Ayodhya by her grandson Yatindra Mishra on December 13, 1999. The Princess was a talented semi classical and Awadhi folk singer. She was very keen to promote all forms of music to bring to the fore the cultural panorama of India. This foundation aims at working fro reinvigoration and preservation of Indian Culture, Philosophy, Arts, Literature and music. With these objects in View the foundation organizes a series of music programmes every year and awards Vimla Devi Samman to the maestros for their contribution. As a new step in this direction the foundation has cone out with some landmark recordings of live concerts. It will be a matter of great satisfaction for the foundation to provide the world of music with the rare repertoire.